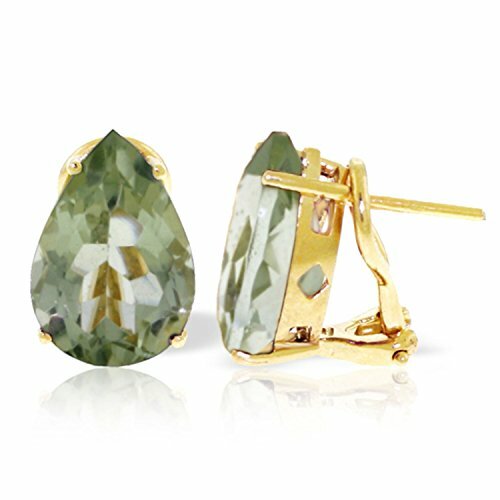 Beautiful stud earrings can add class to any outfit that needs accessorizing and these 14k solid gold French clip earrings with green amethysts are the perfect finishing touch when getting dressed up. Pear cut solitaire stones sit prettily in each earlobe, with each stone weighing five carats for glamorous style and glorious coloring. The French clips are a wonderful touch, adding a bit of sophistication to these simple but beautiful earrings. Each setting and clip is made of your choice of yellow, white, or rose gold that makes these earrings high quality so that they can be worn again and again.